According to the National Institute of Neurological Disorders and Stroke (NINDS, 2018), autism spectrum disorders (ASDs) are defined as a significant difficulty with social interaction, problems with verbal and nonverbal communication, repetitive behaviors, and narrow or obsessive interests. The term autism spectrum refers to multiple levels of severity and can be broken down further into autistic disorder (the most severe form), pervasive developmental disorder (PDD), and Asperger syndrome (the least severe cases). It is four times more common in boys than in girls. The most recent prevalence statistics from the Centers for Disease Control and Prevention’s (CDC, 2018) Autism and Developmental Disabilities Monitoring network (ADDM) show the number of ASD cases has more than doubled in ten years. As of 2014, the estimates are 1 in 59 people in the US have been diagnosed with ASD, compared to 1 in 125 in 2004 (CDC, 2018). The National Health Interview Survey (NHIS) (Xu, Strathearn, Liu & Bao, 2018b) has shown slightly higher rates than this. Their results showed a reported rate of 2.24% in 2014, 2.41% in 2015 and 2.76% in 2016. The primary difference between these two sources is that the ADDM statistics are based on clinician review of both educational and healthcare evaluations at 11 separate sites throughout the country, while the NHIS is a nationwide telephone survey that reflects verbal reports from parents regarding the presence of a physician diagnosis that has been previously made. The increase in the prevalence of ASD has been attributed to both etiological factors, such as genetics and environmental factors, as well as nonetiological factors, such as changes in diagnostic criteria, public awareness, screening patterns, and referral patterns. ASD is more commonly found in patients that are white (Xu et al., 2018b). While the exact cause of ASD is still unknown, there is a lot that the medical community has determined about ASD through its research in the last 10-15 years in response to its growing prevalence. The Childhood Autism Risks from Genetics and the Environment (CHARGE) study based in California is designed to help collect information and research to determine the causes of autism and ASD. The NINDS cites a combination of both environmental and genetic features that combine forces to cause ASD (NINDS, 2018). Regarding the role of genetics, much of what is known about the heritability of conditions is based on twin studies. Identical twin studies have shown ASD in both twins between 36-95% of the time and between 0-31% in non-identical twins (CDC, 2018). One of these more recent studies conducted by Sandin et al. (2017) utilized over 37,000 pairs of twins, over 2 million sibling pairs, and over 800,000 half-sibling pairs to attempt to determine ASD heritability. Overall, their statistical analysis revealed that ASD had a heritability of 83%, with environmental factors responsible for the remaining 17% (Sandin et al., 2017). A 2014 study by Jeste & Geschwind looking at the heterogeneity of ASD states that between 10-20% of patients with ASD have de novo or sporadic genetic mutations that are identifiable using our current genetic testing. They point towards Next Generation (NextGen) sequencing of exomes or chromosomal microarray analysis (CMA) as newer technologies that are being developed and improved to help us understand the role of genetics in all diseases, including ASD (Jeste & Geschwind, 2014). A history of mental illness in a parent was shown to increase the risk of ASD in their child in a recent very large population-based cohort study in Sweden of over 500,000 participants. In this group, 63% of patients with ASD had a parent with history of mental illness compared to just 45% of healthy controls (Xie et al., 2019). Qin et al. (2016) performed a systematic review and meta-analysis involving 2,896 participants regarding brain-derived neurotrophic factor (BDNF) in which they found significantly higher levels of BDNF in peripheral blood samples of patients with ASD versus health controls. BDNF is a prominent, widely expressed neurotrophin which effects neuron survival and growth, synapse formation and plasticity, cell differentiation and cognitive function (Qin et al., 2016). A portion of the CHARGE study found anti-fetal brain autoantibodies in higher numbers in mothers of ASD patients (23%) versus control mothers (1%). These antibodies were also more prevalent amongst mothers with metabolic conditions such as gestational diabetes, obesity, and hypertension, all of which create low-grade inflammation and insulin resistance. IgG antibodies, including this specific type, are able to cross the placenta after 13 weeks’ gestation in order to provide passive immunity to the fetus from various infectious agents. The blood-brain barrier is also known to be more permissive during fetal development (Krakowiak, Walker, Tancredi, Hertz-Picciotto, Van de Water, 2017). The first environmental factor that comes to mind for most people regarding ASD is the question surrounding vaccinations. A conclusive meta-analysis of the data surrounding vaccinations and ASD was published in 2014 (Taylor, Swerdfeger & Eslick, 2014). They reviewed 5 cohort studies involving over a million children and 5 case-control studies involving almost 10,000 children. They found no association between vaccinations and ASD or autism disorder specifically, including MMR vaccination or vaccinations containing thimerosal or mercury. They also pointed out that a 2012 Cochrane review failed to establish a link between ASD and the MMR vaccination (Taylor, Swerdfeger & Eslick, 2014). In 2015, Jain et al. investigated the MMR vaccination further using a retrospective cohort study of over 95,000 high-risk children (siblings of patients diagnosed with ASD). They found that administration of the MMR vaccine was not associated with increased ASD risk, but they did find that the vaccination rate amongst these children was 11% lower at age two years and 6% lower at age five years (Jain et al., 2015). More recently, a California study of over 81,000 mothers and their children found no association between ASD incidence and maternal administration of the tetanus, diphtheria, and acellular pertussis (Tdap) vaccine (Becerra-Culqui, Getahun, Chiu, Sy & Tseng, 2018). Regarding other potential environmental factors that may contribute to ASD, a review of the current evidence in 2014 found an association between increased ASD risk and decreased maternal consumption of polyunsaturated fatty acids or increased exposure to air pollution (specifically exposure to heavy metals and particulate matter). They found insufficient evidence to establish a clear association between ASD risk and maternal vitamin D intake, tobacco or alcohol use, or exposure to pesticides, phthalates, or bisphenol A (BPA) (Lyall, Schmidt & Hertz-Picciotto, 2014). Later that same year, a portion of the aforementioned CHARGE study published findings that found a 60% increased risk of ASD when mothers were living within 1.5 km from a farm with agricultural pesticide use. This was a population-based case-control study of 970 participants residing in California (Shelton et al., 2014). Prenatal exposure to selective serotonin reuptake inhibitors (SSRIs) was found to be loosely associated with a higher risk of ASD or developmental delay in general, especially in boys and when exposure occurred in the first trimester, but this association failed to reach statistical significance (Harrington et al., 2014). Later, a systematic review and meta-analysis assessing the association between ASD and maternal antidepressant medication use in 2017 found six case-control studies that showed a positive association between maternal antidepressant use before and during pregnancy and an increased risk for ASD. However, they found 2 cohort studies which found no association, and they cited the presence of maternal psychiatric condition(s) as an obvious possible confounding factor (see the results of Xie et al. above) (Mezzacappa et al., 2017). Labor and delivery complications leading to periods of hypoxia (NIEHS, 2019). The National Institutes of Health (NIH) lists the maternal use of prenatal vitamins before and during pregnancy and folic acid supplements during the first month of pregnancy as protective factors known to decrease the risk of ASD (NIEHS, 2019). This conclusion is in-part based upon the findings of Levine et al. (2018) who analyzed the medical records of 45,300 children and found a statistically significant decrease in risk of ASD when mothers took daily multivitamins and folic acid supplements before and during pregnancy. The hallmark signs and symptoms of ASD include persistent social communication challenges as well as restricted and repetitive behaviors that begin in early childhood and interfere with daily life. Verbal and non-verbal communication skills are often affected, and around ⅓ of patients with ASD are nonverbal. Patients have difficulty using and understanding spoken language, gestures, eye contact, facial expressions, tone of voice, and idioms or other figures of speech not meant to be interpreted literally. Many may struggle to both recognize and express emotions in themselves or others around them, feel overwhelmed in social situations, and have difficulty gauging personal space. The repetitive behaviors may include body movements, motions with external objects, rituals, narrow or extreme interests, staring at lights/spinning objects, and a need for a strict consistent routine with difficulty or resistance to change (Autism Speaks, n.d.-a). ASD should be given a grade of severity between 1-3. It is oftentimes quite difficult to differentiate between ASD and intellectual developmental disorder or social communication disorder (Autism Speaks, n.d.-a). Despite all of these challenges, 44% of patients with ASD have average or above-average intelligence. ASD can be diagnosed as early as age two, but on average most children are not diagnosed until 3 years, 10 months (in the case of autistic disorder) or 5 years, 7 months (in the case as Asperger syndrome) (CDC, 2018). The CDC and the American Academy of Pediatrics (AAP) recommend screening all children at their 18 and 24-month well child visits specifically for ASD, and at their 9, 18, and 24-month visits for development delays in general (AAP, 2019; CDC, 2018). 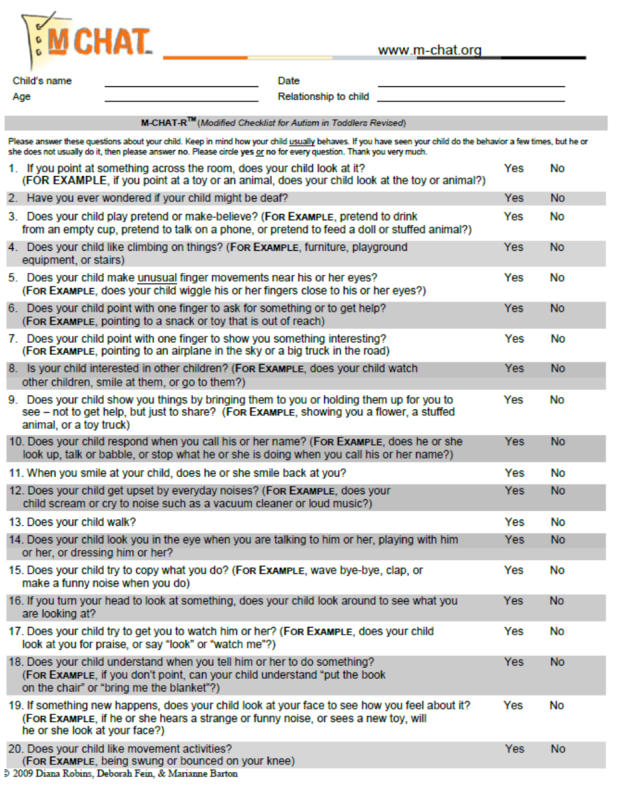 The Modified Checklist for Autism in Toddlers, Revised and then with Follow-up (M-CHAT-R and M-CHAT-R/F) is one of the most widely used and studied screening tools for ASD. The M-CHAT-R (see figure 1 below) consists of 20 yes/no questions for parents or caregivers that can be filled between 16 and 30 months of age. A score of 0-2 indicates low risk with nothing additional required. A score of 3-7 is medium risk and the M-CHAT-R/F is recommended. M-CHAT-R/F is a provider interview using the same 20 questions with additional follow-up inquiry. A score of 8 or above is high risk and an immediate referral to a specialist for further evaluation is recommended (Robins et al., 2018). The CDC recommends that a final diagnosis be made by a developmental pediatrician, pediatric neurologist, pediatric psychologist, or pediatric psychiatrist (CDC, 2018). The US Preventive Services Task Force (USPSTF) released its latest recommendation in 2016 regarding ASD screening in children between 18 and 30 months old. They issued what is called an I-statement, which indicates that at the time the recommendation was being synthesized, the literature was insufficient to assess the balance of benefit versus harm in screening for ASD in patients for whom no concerns of ASD have been raised by their parents or a clinician. They did find evidence that current screening tools such as the aforementioned M-CHAT-R can reliably detect ASD when concerns do arise (Siu et al., 2016). Silverstein and Radesky (2016) wrote that this conclusion was likely related to a small sample size and variable quality of studies that tested the utility of screening and its impact on clinical outcomes. They did find that prevalence of ASD varies widely based on socioeconomic status, race/ethnicity, and geography, which leads one to believe that perhaps cases of ASD are being missed in certain populations and perhaps more regular screening could lead to improved detection in these groups. They also commented that an I-statement from the USPSTF does not equate to a recommendation against screening, and that the task force specified the evidence for the clinical impact of screening in groups of patients without parental concern is lacking at this time (Silverstein & Radesky, 2016). A number of other conditions often accompany ASD. The CDC found that 10% of patients with ASD have been diagnosed with another genetic disorder, and 10% with a psychiatric disorder (CDC, 2018). The NIH lists sleep disturbances and gastrointestinal (GI) dysfunction as more common in patients with ASD. They warn against an increased risk for seizures in children with language regression before the age of three, and amongst adolescents with ASD they found an increased risk for depression and other behavioral problems (NIEHS, 2018; NINDS, 2018). Related to depression in patients with ASD, a population-based cohort study in Sweden found that by age 27, almost 20% of patients with ASD also reported a diagnosis of depression compared to just 6% of the control population. They found this risk for depression was even higher in patients with ASD without intellectual disability (Rai et al., 2018). Respiratory, skin, and food allergies are also more commonly seen in patients with ASD. In a population-based cross-sectional study in the US, researchers found around a 6% increased prevalence of all three types of allergies amongst patients with ASD versus the control population (Xu et al., 2018a). GI dysfunction occurs in between 9-90% of ASD patients depending on the study that is referenced. Symptoms include chronic constipation, abdominal pain, diarrhea, and encopresis (stool soiling beyond the age of toilet training). In an attempt to determine whether these GI symptoms may be an earlier sign of ASD, high risk infants (with an older sibling diagnosed with ASD) were monitored for GI symptoms. The high-risk infants had a higher rate of constipation compared to low-risk infants, and when fed an exclusive breast milk diet showed significantly less GI symptoms than the high-risk infants on no breast milk (Penn et al., 2016). Other commonly associated medical conditions include feeding problems, sleep disturbances, attention deficit hyperactivity disorder (ADHD), anxiety, and obsessive-compulsive disorder (OCD). These and any other comorbid conditions should be appropriately treated in order to allow a child the best possible chance of success in their ASD treatment (Autism Speaks, n.d.-b). Regarding long term outcomes in adults with ASD, a systematic review in 2014 found there is much heterogeneity within the ASD population. Out of 25 studies reviewed, some indicated social function, cognitive ability, and language skills remained stable throughout life, yet significant change was seen in others. Overall, adaptive functioning improved over time. Regarding IQ, two studies showed decline, four showed stability, two showed improvement, and three indicated too much variability to identify a significant trend. Regarding language skills, five out of seven studies showed improvement throughout life into adulthood. They also found a slight trend of overall improvement in core autism symptom scores into adulthood. Regarding social integration, they found most adults with ASD were rated as poor or very poor, and over half were not living independently or self-sufficient. Studies showed that better childhood IQ and language skills were positively associated with overall function as adults (Magiati, Tay & Howlin, 2014). There is, unfortunately, no cure for ASD, but therapy in the form of educational and behavioral interventions and certain medications can help with many of the symptoms. It is generally accepted that the earlier the therapy is started, the better the outcomes (NINDS, 2018). Therapies that begin when the child is younger than three, called Early Intervention Services (EIS), are typically organized through the state or local government, sometimes via a local school system, and include basic therapies such as speech and language therapy (SLP), physical therapy (PT), occupational therapy (OT), and developmental intervention (DI) (CDC, 2015). A very recent cohort study regarding children in an urban EIS program found that only 73% of patients referred actually initiated services, and only 43% successfully started services within the federally-mandated deadline of 45 days. Their results indicated that one additional hour of therapy per month was associated with a three-point functional gain on the Child Outcomes Summary score (McManus, Richardson, Schenkman, Murphy & Morrato, 2019). Better outcomes are seen if interventions are started before the age of four, including decreased severity scores, increased IQ scores, and improved adaptive skills. A Canadian study showed a significant lifetime savings when patients with ASD were started in intensive behavioral intervention without any waiting period (Piccininni, Bisnaire & Penner, 2017). Behavioral and communication therapies for ASD seek to provide structure, direction, and organization for patients and families. Examples include applied behavior analysis (ABA), picture exchange communication system (PECS), developmental, individual differences, relationship-based approach (DIR or “Floortime”), treatment and education of autism and related communication-handicapped children (TEACCH), relationship development intervention (RDI), and cognitive behavioral therapy (CBT). The CDC estimates that intensive behavior therapy costs roughly between $40,000 and $60,000 per child annually (Autism Speaks, n.d.-b; CDC, 2015; National Institute of Child Health and Human Development [NICHD], 2017). ABA has been used since the 1960’s and encourages positive behavior through rewards and discourages negative or unwanted behavior by ignoring it. It aims to help improve the child’s communication, attention, focus, memory, and academics while decreasing problem behavior. Its benefits are that it is flexible: it can be done anywhere and either one-on-one or with a group. It typically occurs for 25-40 hours per week and can last for 1-3 years. It breaks the learning process down into the ABCs: Antecedent, Behavior, and Consequence. There are multiple versions or subtypes. For children12-48 months old, the Early Start Denver Model (ESDM) focuses on play to build positive relationships. Early intensive behavioral intervention (EIBI) is targeted at children 3-5 years old. Discrete trial training (DTT) is a style of teaching that utilizes a series of trials to teach individual, broken-down steps of a desired behavior or response. Pivotal response training (PRT) attempts to motivate a child to want to learn, monitor their own behavior, and initiate communication with others through positive reinforcement. It targets “pivotal areas” such as initiation of social interactions and self-management and rewards effort, not perfection. It is play-based and child-lead and has the advantage of often being done at home in the child’s own environment. Verbal behavior intervention therapy (VB or VBI) focuses on teaching verbal communication skills by combining the principles of ABA with the work of BF Skinner. It strives to connect words with their use or purpose to help children understand why we use words and how they can be useful to them. Positive behavior support (PBS) seeks to determine the root cause of a negative or unwanted behavior, change the environment, and then teach skills regarding the correct or desired behavior as a replacement (Autism Speaks, n.d.-b; CDC, 2015; NICHD, 2017). Often used in very young children with significant verbal impairment, PECS teaches children to utilize pictures as aids for communication of wants and needs (CDC, 2015). Floortime or DIR focuses on the emotional and relational development of the child and how they regulate their sensory perception of sights, sounds, and smells, and many children with ASD have issues with sensory reactivity. The key is to get down on the floor (hence the name) and play with children at their level, allowing them to lead initially and then guiding them towards six milestones: self-regulation and interest in the world, intimacy and engagement in relationships, two-way communication, complex communication, emotional ideas, and emotional thinking (Autism Speaks, n.d.-b; CDC, 2015). TEACCH was developed in the 1960’s at UNC Chapel Hill and uses visual cues to break skills and behaviors down into smaller and more manageable steps. It is primarily a classroom strategy that utilizes an ASD patient’s natural strengths (visual information processing) to build on their individual challenges (social communication, attention, and/or executive functioning) with organizational supports, visual and written information, and structured support for social communication (Autism Speaks, n.d.-b; CDC, 2015). RDI is a family-based therapy that aims to build social and emotional skills by training the parents to be the child’s primary therapist and teaches dynamic intelligence (mental flexibility) (Autism Speaks, n.d.-b). CBT focuses on the connection between the child’s thoughts, feelings, and behaviors. It can be very helpful with anxiety, especially in social situations (NICHD, 2017). A lot of the success for patients with ASD relies on the skills, capabilities, education, and training of their parents. When a parent training program was directly compared with parent education only (the same information regarding their child and their condition but no coaching on specific behavioral management techniques) they found significantly less problem behavior based on a parent checklist at 24 weeks in the training group versus the education-only group (Bearss et al., 2014). Regarding medication, there is currently only one FDA-approved medication for symptoms commonly associated with ASD. Risperidone (Risperdal) is FDA- approved for agitation/irritability in patients with autism between the ages of 5-16. Various other medications are used off label for other signs and symptoms. SSRIs may be used for depression, anxiety, repetitive or aggressive behavior. Tricyclic antidepressants may also be used for the same above indications, with potentially less adverse effects and improved effectiveness in certain patients. Atypical antipsychotics, similar to risperidone above, may be used for hyperactivity, withdrawal, and aggression. Stimulants may be used for improved focus and reduced symptoms of hyperactivity. Anti-anxiety medications may be used for symptoms of anxiety or panic disorder (NICHD, 2017). Finally, there are also a number of complementary and alternative treatments that are available and reasonably safe, despite having little or no scientific evidence indicating they are effective. Dietary changes may provide variable success, including elimination diets removing items such as dairy products, gluten, sugar, etc. Use of camel’s milk, for example, in lieu of cow’s milk, has shown some promising early results. Again, the scientific support for these and most dietary supplements such as fish oil and vitamin D or B are variable. Early studies regarding hyperbaric oxygen therapy are promising but early and small. Chelation is a treatment to remove certain heavy metals (ie. lead) from the blood and body. Biologicals such as secretin have been reported to reduce GI dysfunction, and therefore reduce behavior characteristics in patients with ASD. However, secretin has little to no evidence of effectiveness and can have significant adverse effects. Music therapy has shown promising results with communication, social reciprocity, and emotion. Sensory integration therapy, acupuncture, and massage are all cautiously supported by the evidence and with little to no potential adverse effects (Brondino et al, 2015). All of these adjunct treatments should be considered carefully until further evidence provides additional proof of safety and efficacy.